The Viking Age in Denmark represented an eventful period of time that saw the rise of the Danish Vikings as an important military force in northwestern Europe. So it is that during the Early Middle Ages the Danish Vikings voyaged across the North Sea to Britain and established the Danelaw, a historical regional in eastern Britain where the laws of the Scandinavian settlers held sway over those of the Anglo-Saxons during the 9th century. The Viking Age officially started in the late 8th century, specifically in the year 793, when a group of Norwegian Vikings attacked the Catholic abbey of Lindisfarne, located less than one mile off the northeastern coast of the Kingdom of Northumbria (however, a recent research suggested that it actually commenced in Ribe, Denmark approximately 70 years earlier). Since then, both the Norwegian and the Danish Vikings recurrently raided Britain in the upcoming three centuries. The Norse raided parts of Ireland, Scotland, the Orkneys, Shetlands, Hebrides, and the Isle of Man, while the Danes attacked the Anglian kingdoms of Wessex and Mercia. The Danelaw was established as a result of King Alfred the Great’s efforts to avoid further Viking raids in the Anglian Kingdom of Wessex. He proceeded by ceding lands to the Danes who then engaged primarily in trade and built settlements. It is also known that the Danelaw consisted of fifteen shires. 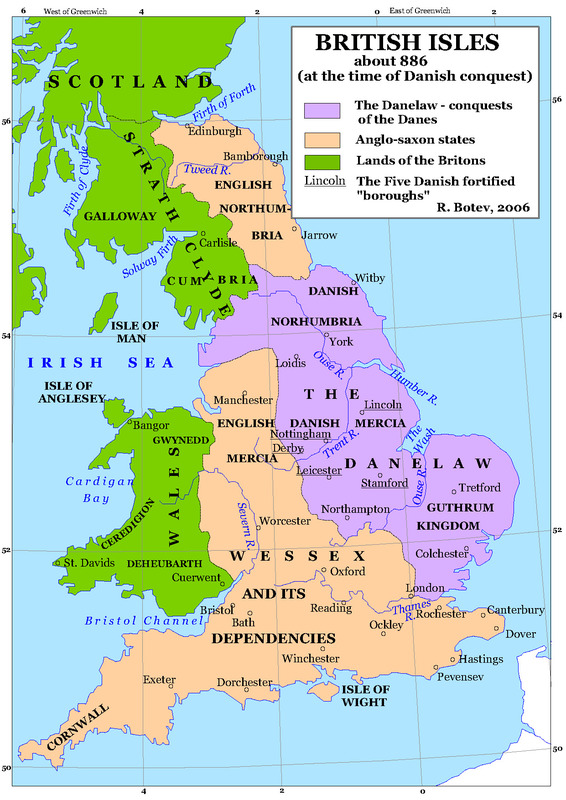 The territorial extent of the Danelaw comprised as such the modern day shires of York, Nottingham, Derby, Lincoln, Essex, Cambridge, Suffolk, Norfolk, Northampton, Huntingdon, Bedford, Hertford, Middlesex, and Buckingham. In Danish, the Danelaw is known as ‘Danelagen’ and in Old English as ‘Dena lagu’, being described in the Anglo-Saxon chronicle, a collection of annals recounting the history of the Anglo-Saxons which was written during the late part of the 9th century. The term ‘Danelaw’ can also denote, aside from its geographical meaning, a set of terms and laws as defined in several treaties between the King of the West Saxons during the 9th century, namely Alfred the Great, and the Danish war lord, Guthrum. After nearly a decade from the Battle of Edington (one of the most significant battles of the Viking period which took place in 878), the Danish Vikings under Guthrum were given land by Alfred the Great and the boundaries of the Danelaw were drawn. Between the 9th and 11th centuries, the Danish Vikings were also given the Danegeld (literally meaning ‘The Danish tax’) as a tribute for not waging war in either England or Francia. However, the term ‘Danegeld’ appears only starting from the 20th century in literary works, while the documents of the High Middle Ages describe the tax paid to the Danish Vikings as either ‘geld’ or ‘gafol’. It was also the Danish Vikings and the Norwegian Vikings that gave the name of an important region situated in northern France, namely Normandy (stemming from the Old French word ‘normanz’, referring to ‘Northmen’). Rollo (or Göngu Hrólfr, as he was known in Old Norse) was a Norse chieftain who raided present-day France during the late 9th century. In the early 10th century he alongside his men were given land by the then King of Western Francia, Charles III the Simple, in exchange for their protection against subsequent incursions of other Viking war waging bands. Thus, Rollo became the Count of Rouen (his reign lasting from 911 to 927), and far more important than that, the ancestor of William the Conqueror who had subsequently conquered England at the Battle of Hastings in 1066. 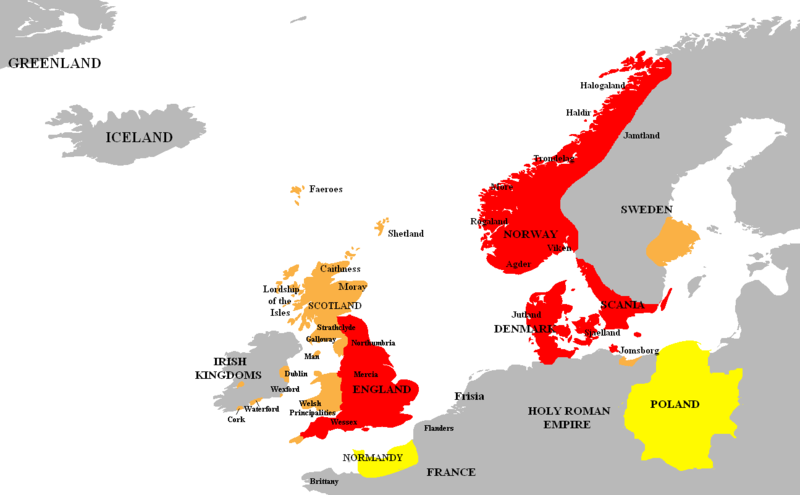 Aside from contemporary northern France and eastern England, the Danes were also interested in settling parts of Wales and Ireland. In Ireland, the Danish Vikings were referred to as ‘Dubhgall’ and came to settle there after the Norwegian Vikings did (who were referred to as ‘Fingall’). Eventually, centuries of cohabitation between the Norsemen and the local Gaels made possible the rise of the Norse-Gaels as the predominant military and political force in early medieval Ireland and Scotland. Aside from being renowned warriors, the Danish Vikings were also skilled blacksmiths, excellent seafarers, good traders and are also reputed for having built the ring-shaped fortresses in Denmark. These fortifications are believed to have been used as military bases for the invasion of England in the 11th century, being associated with either King Sweyn Forkbeard or King Harald Bluetooth. Another theory has it that they were used as trading posts that handled goods in and outside Scandinavia. The historical legacy of the Danish Vikings is still noticeable today in many aspects of the English culture, from the English language itself (which was significantly influenced by Old Norse, the mother tongue of all modern North Germanic languages), to place names, genetics, and even the sarcastic humour (stated by the Danish ambassador to the United Kingdom, Mr Claus Grube). Thus, there is clearly a common cultural heritage between the English and the Danes which dates back to more than one thousand years. Why hasn’t Iceland and Greenland been cited? Scotland didn’t exist in 886 this was before the Irish invasion.